Now, before we get into some things, I do not speak for the entire Black community and this is simply my opinion. It’s a long definition, but cultural appropriation is difficult, tricky, and nuanced. Since the record-breaking “7 rings” dropped (read my review here), claims that Ariana Grande is appropriating Japanese and Black culture have been thrown around across various media platforms. Since the release of the promotional single, “imagine” (read my review here), Ariana has been increasingly using Japanese characters in the artwork and videos of her subsequent singles. In the “7 rings” video Japanese characters are blasted across the screen, and what appears to be Japanese paraphernalia get up-close shots. It becomes apparent that Ariana seems to be using the Japanese language as an aesthetic for her visuals. Truthfully, I felt uncomfortable with the use of the Japanese characters, they felt almost prop-like and purely for effect. This would be concerning, but Ariana has been learning Japanese for the past half-decade and she has successfully spoken the language with her Japanese fans. Anyone who has followed Grande’s career knows that since her first promotional visits to Japan, she developed a deep love and appreciation for the culture. Unlike Katy Perry’s infamous 2013 performance of “Unconditionally” at the American Music Awards, Ariana is not dressing up as a geisha and further propelling any harmful stereotypes about Japanese culture and Japanese people. Now, whether or not her use of the language as a visual aesthetic is offensive is a question only Japanese people can answer. This, I think, is the most important takeaway. I think that if people consider it cultural appreciation and find no issue with it, then all “appropriation” claims are null and void. People of the culture that is supposedly being “appropriated” have the final say, and from what I have seen, it is mainly people from different cultures throwing these claims around. Similarly, Ariana has been accused of appropriating Black culture for this song and video. Let’s start with the tan. I’ll admit I’ve become a little concerned about how dark Ariana’s tan seems to be getting. Nevertheless, it is also important to note that the most widely circulated pictures of her will be screen grabs from music videos and photographs at professional events. Lighting changes how we perceive color a lot, so she can look almost *too* dark in a music video and still look perfectly fine a paparazzi candid. In my opinion, Ariana is still far away from the “blackfishing” Instagram models, especially because she isn’t actively taking up spaces and roles that Black women deserve. There are Black women of all sizes and shades in the “7 rings” music video and she even made a Black woman God in her “God is a woman” music video. Ariana Grande at 2018 MET Gala. 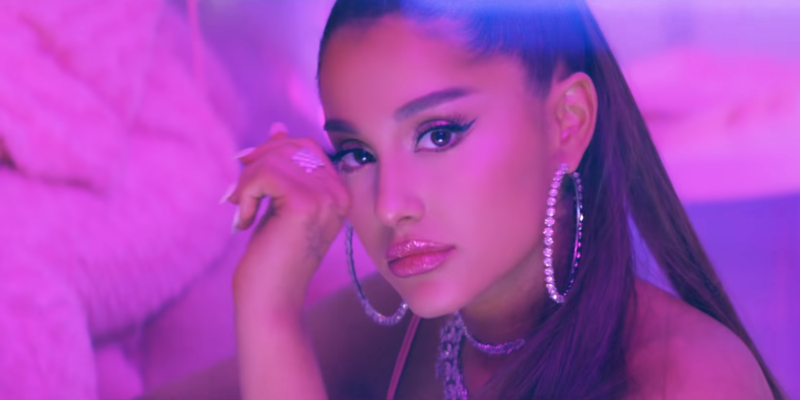 Now let’s get into the sound of “7 rings.” The song is pop with melodic trap-influences. This is not a new sound for Ariana. She’s experimented with this sound on tracks such as: “God is a woman”; “goodnight n go”; and “everytime.” And these are just songs on her last album. To imply that Ariana’s gone through an abrupt image change is absolutely ludicrous and false. She’s been making a fusion of pop, hip-hop, R&B, and soul music since her debut album, Yours Truly. Legendary R&B producer and songwriter, Babyface, was one of the main producers on Ariana’s debut album, with credits on nearly half of the tracks. On Ariana’s second album, My Everything, she went for a decidedly poppier sound but still found a way to include various rappers (Childish Gambino, Big Sean), smooth R&B (“Love Me Harder” with The Weeknd) and rap-singing (“Hands on Me”) on the record. Ariana’s always loved and respected hip-hop/R&B/rap music. This is the same girl who rapped Big Sean’s “Guap” live on radio and Nicki Minaj’s “I Get Crazy” on USTREAM. This isn’t a new thing for her. The most important thing is that Ariana’s closest friends and producers, Tommy Brown & Victoria Monét, have had writing and production credits on every single project of hers since (and including) her debut album. She constantly uplifts them and explicitly credits them on her socials, which a lot of artists do not do. Even after “7 rings” dropped, Ariana requested that we “shift our attention” to the ladies who made this song possible. This includes talented women of color like Victoria Monét, Tayla Parx, and Kaydence. Not once has Ariana ever tried to erase the impact of Black artists on her sound and artistry. She constantly cites Brandy, Mariah Carey, Whitney Houston, Beyoncé, India.Arie, and more as her biggest influences and inspirations. Ariana has never made a mockery of or bad-mouthed Black culture. Unlike Miley Cyrus, who unfairly lambasted and demonized Black culture after using it to sell records during her Bangerz era, Ariana has always respected the culture and understood her place as a white woman. Furthermore, on the last two verses of “7 rings,” Ariana raps. Rapping has not been exclusive to Black music and Black culture for a long time now. Ranging from Vanilla Ice and Eminem to Macklemore and Iggy Azalea, rapping is no longer exclusively Black. There’s absolutely nothing offensive about a 20-second sing-song rap verse on a pop song. If you find a problem with the rap on “7 rings,” but find no issue with non-Black rappers, such as 6ix9ine and Lil Pump, saying the N-word and making a mockery of the music and culture…. you need to reevaluate yourself. People continue to support convicted rapists (Kodak Black) and pedophiles (6ix9ine, R. Kelly), but want to claim Ariana Grande of all people is ruining hip-hop. It’s perfectly fine to not like the song, but to go as far as to say hip-hop is now “officially gentrified” is stupid and melodramatic. Hip-hop has been gentrified for years now, and that has nothing to do with Ariana Grande. Some people have also made the argument that Ariana stole from Soulja Boy and Princess Nokia for the song. Firstly, the flow Ariana used on “I want it / I got it” is so painfully generic that I’m confused as to why anyone would want to claim credit for it. Furthermore, Soulja Boy initially had no issue, but now he claims that she’s “a thief” because he isn’t getting the attention he wanted. On the subject of Princess Nokia, the same thing applies, the flow is generic. Everyone has used it or a version of it at some point. Of course, it doesn’t help that producers have come forward claiming that Princess Nokia allegedly stole the song from them, and she was accused of stealing another song from Kali Uchis. People of the allegedly “appropriated” culture have the final say on whether or not those claims are valid. Malicious intent, immediate disposal of the culture and its people after a truncated period of use, or purposeful perpetuation of negative stereotypes associated with the culture in question are pertinent when throwing cultural appropriation claims around. Ariana needs to watch it with that tan.